I didn't know about being featured, because the producers forgot to inform me about it. LOL. Thankfully, they didn't forget to include me in the credits. In early August, one of the producers messaged me for permission to use my video. She said that it was shortlisted along with a few other videos, all of which were found via Facebook hashtags & YouTube search. When she didn't get back to me, I thought that they had gone with another video. I think they made the right choice with this cikgu, don't you? When I saw myself on screen, y'alls, I so sangat bangga tau! Macam glow in the dark dalam cinema gelap tu! I watched the movie with my wife & brother in law. When he saw it, he was like "Wait. That's you!" My wife said it best. She just held my hand & beamed. It was my once in a lifetime opportunity! My literally 3 seconds of fame, so glad I didn't blink & miss it. After the scene where a main character broke down in tears after receiving terrible news, 3 seconds of a Youtube video of mine was played as a transition into the scene where a little girl was watching my video while asking her mother why people went home to vote. It was the Youtube video where I spoke about how global Malaysians were moving heaven & earth to get their postal votes home & the miracle of personally finding someone to bring my postal vote back to Kuching. I also encouraged Malaysians in Malaysia to go out & vote; making their votes count, instead of buang undi or tak undi. If you watched the movie, did you realise that it was me? Did my doublechin-chin freak you out? I'm so glad that I spent Malaysia Day watching a movie that's not about rampas suami orang, cinta segi tiga, kahwin perogol, gangsterisme, lawak bodoh, kontrak berjuta-juta, datuk-datuk, datin-datin, or hantu. 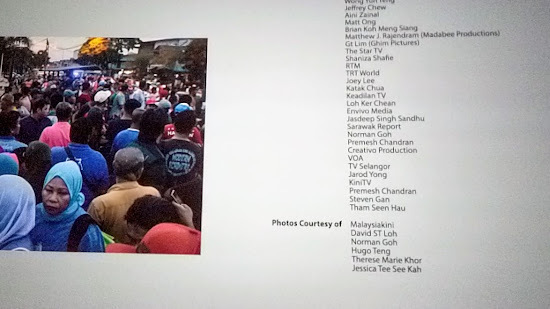 I watched & was part of a movie depicting stories of regular Malaysians struggling to care for their loved ones, make hard decisions, & stand up for what is right. The movie reminds me of, not too long ago, how Malaysians all around the world rose up, banded together & self-organised in order to get postal votes back home. Together, we fought to make our votes count. We saved Malaysia, but the struggle has only just begun. We need to right many wrongs & ensure that new Malaysia is for all Malaysians, regardless of race, religion, or socioeconomic status. Tomorrow is your last chance! Experience & reflect on Rise: Ini Kalilah, a Malaysian production worthy of your support!